Thinking about getting out next week to try for my first pike on a fly, I have my trusty No 8 Rod ready, and the wire traces and a slightly. 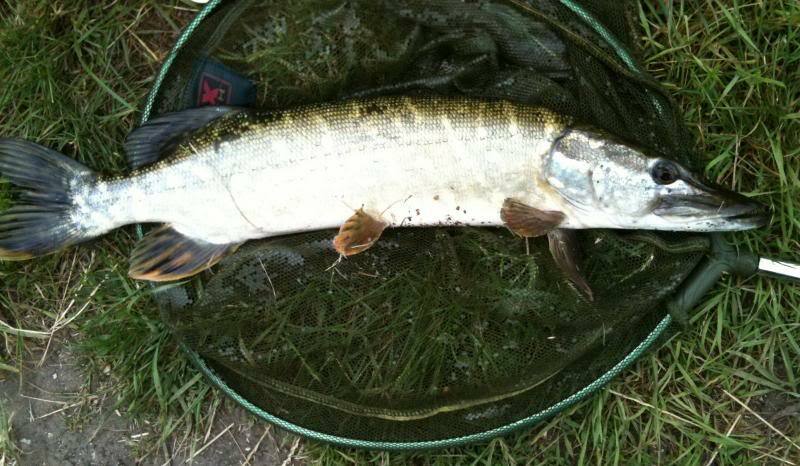 the piece of water i have found it a canal and the pike are about 5ib and are hounding the course fishemen at weekends. they are stalking the fish from the margins one angler thinks there are as many as a dozen in the space of 3 swims. here is one i picked off on a spinner, i was actually trying for perch as aparently there are some perch up to 5ib in the same stretch. Any tips would be welcomed, and Hellbound you up for maybe giving it a go next week? I think I would take a 'match the hatch' approach by matching my fly size to the stamp of fish the match boys are after. If the canal is fairly narrow then I'd go for a floating line and if the water clarity is poor I'd go for a bright fly. If it is gin clear then go for something more subdued but the bottom line is if they want it, they will have it. If you see me on the bank, say hello. the water was coloursed at the weekend so will use your tips. the course anglers were picking up small silver fish so will look at matching to those, the pike i had was on a small spinner so think they are chasing a variety of sizes. Roach and Perch lookalike's - along with a silver Flashabou Sparkler - sizes matched to, as Alan says, the fish already taken by the Pike as prey, should be all you need for starters. Please don't forget the usual tackle for safe landing and handling.